•Do not combine AVCC with the VCC (main power) pin. This will apply wrong voltage to the AVCC pin. 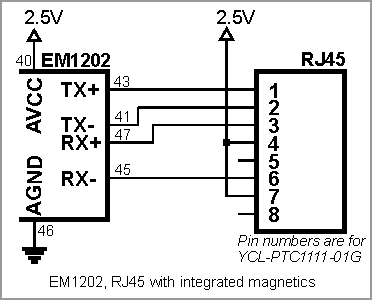 Doing so appears to be causing no immediate permanent damage to the EM1202, but the circuit will not work and the effects of prolonged over-voltage on the AVCC line are not known. You can use either a standalone magnetics part (such as YCL-PH163112) or RJ45 connector with integrated magnetics (i.e. YCL-PTC1111-01G). Here is a connection diagram for the YCL-PTC1111-01G jack with integrated magnetics. •Route TX+, TX-, RX+, RX- in such a way that they do not cross each other. Try to avoid using vias (keep on the same board side). •Keep more or less uniform distance between "+" and "-" traces of each pair. The EM1202 also has two Ethernet status LED control lines- see here for details.